You may think of stress balls as desk toys or a piece of branded swag given away at trade shows. But stress balls are actually really useful tools for all types of people. If you regularly experience stress, especially at work, you know how difficult it is to get rid of the tension and anxiety that builds up in your body. This article covers the benefits of using stress relieving toys and also some of the best stress balls to relieve tension. Stress balls are a fantastic little tool because they actually help you relieve stress. Stress is a psychological response that manifests physically in our bodies. You may notice a quickened heartbeat, racing mind, and tense muscles. While there’s plenty of ways to relieve stress like meditating, exercising, or talking it out with a friend, those options aren’t always available or practical. Stress balls are often associated with offices, which makes a lot of sense. Work is a huge source of stress for many people and you can’t exactly get up in the middle of your workday and go take a run to work out your stress. Instead, you can grab your stress ball and give it a good squeeze to help relieve tension in your muscles and help relax your body. 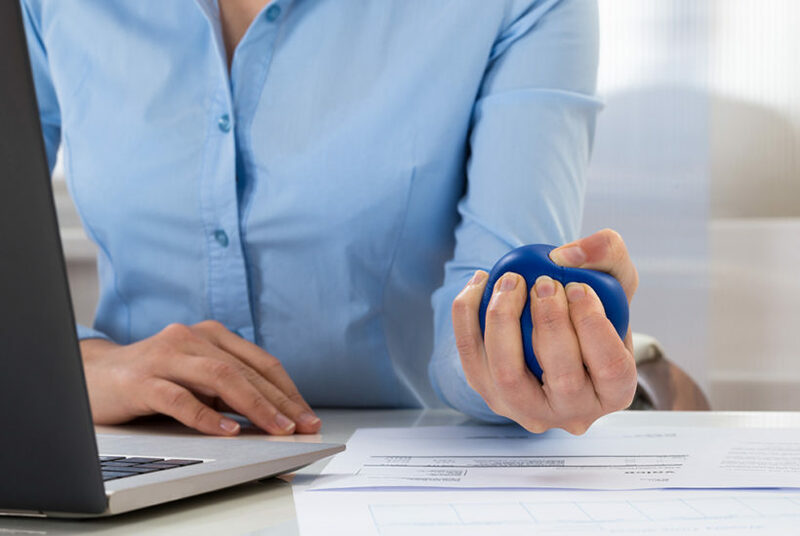 Another benefit of stress balls for office workers is they are great to work out any tension in your hands, wrists, and arms from working on a computer all day. It’s great to take a break, stand up and walk around a little while squeezing your stress ball. When you’re shopping for a stress ball, you want to keep a few things in mind. First, make sure you buy a stress ball that fits comfortably in your hand. You want to be able to grip and squeeze it without straining your hand too much. While the default is a round ball, you may find that different shapes feel better to you. You also want the stress ball to be made of a material that is pliable enough for you to squeeze it and exercise your hand. Beyond that, the color and design of your stress ball are up to your personal taste. You may even find that a fun design helps relieve stress and lighten your mood even more. This is one of my all-time favorite stress balls. Designed to double as a physical therapy ball, the Serenilite Stress Ball is made of a tear resistant gel core with a soft fabric cover. Using this ball is unobstrusive and avoids the distraction of other fidget toys that can annoy co-workers. This set features the best stress balls for people who enjoy variety. Dimples’ set of three stress balls are more like brightly colors eggs, shaped perfectly to fit in the palm of your hand. Made from sturdy thermoplastic rubber, each stress ball features a different resistance level so you can choose from a soft, medium, and firm option. This is great when you just want a soft one to work out some stress but prefer a firmer ball to exercise your hands and wrists after a day of typing. As you may guess from the name, these stress eggs have a dimpled surface for easy gripping. The softest ball is best for mindless fidgeting and stress squeezing. The medium and firm options are quite firm and better for concentrated exercises and strengthening. The balls do come with a sheet of hand exercises you can follow. Two color sets to choose from: yellow, red, and blue or orange, green, and black. If you’re not looking for anything fancy, these are the best budget stress balls for fidgeting and relieving tension. Teacher Peach made these foam squeeze balls with kindness and motivation in mind. They come in a set of three, with motivational phrases written on them: “Be Quiet. Be Calm. Be Kind.” “Yes! I can do this!” and “Focus. Listen. Breathe.” With a 2.5″ diameter, these balls are perfectly sized for adult hands. Since they come in a set of three, these balls are perfect to keep one at the office, one at home, and one in the car for stressful commutes. These also make great stocking stuffers or Christmas gifts for co-workers. Available in six color options: blue, green, pink, purple, red, and teal. Rocket Strength offers another high-quality stress ball, but this one is eco-friendly. Instead of being made of rubber, the filling is 100% silicone, which is completely non-toxic. The cover is a soft fabric that makes it extra enjoyable to squeeze. This is a firmer stress toy, so it’s good for working out tension and exercising your hand and arms. This stress ball doesn’t come in any fancy color options, but it’s a great option for hand strengthening and stress relief. If you’re in search of a different texture to take out your tension on, consider the Isoflex. Made from natural latex, this stress ball is filled with soft microbeads. This creates a squishy, satisying texture that is very relaxing. This is a great option if you want something soft you can fiddle with mindlessly. If you’re looking for a stress ball to strengthen your hands, this will work to some degree, but you might find a firmer stress ball like the Rocket Strength or the Dimples Excel is better for exercise. Yes! Squeezing a stress ball helps you release the tension in your muscles that is created by stress. The squeezing motion helps release energy so your muscles can relax. When your body relaxes, your mind will relax as well, helping to relieve overwhelmed and anxious feelings. Squeezing a stress ball is just one of many ways to relieve stress, but it’s one of the most convenient ones. You can do it at any moment, like when you’re trapped at your desk at work, and help yourself find a little relaxation in a hectic day. Other benefits of stress balls include increasing blood circulation and strengthening hand and arm muscles. A stress ball can also be used as a point of focus for mindfulness exercises and meditation. What is inside of a stress ball? The inside of a stress ball depends on the type of stress ball you’re using. Many stress balls–especially the kind given out as corporate gifts–are made of foam. Fancier stress balls can be made with a special gel filling or out of durable rubber. How can I make my own stress ball? If you have a funnel on hand, that will make it even easier. You can also cut the top off a water bottle to use in place of a funny. Attach your balloon to the funnel. Pour in a little water and add a tablespoon of cornstarch. Massage the ingredients together. Keep adding more water and cornstarch until the balloon is “full.” You want to fill it up enough that the balloon hasn’t started expanding. Once the balloon is full, detach it from the funnel and tie a knot at the end. Ta-da! You’re done. Looking for more ways to relieve stress? Try these free guided meditations to relieve stress. Calm your mind before bedtime with these nighttime self care habits.